Truthfully, I hate to write about our failure but I thought maybe a I could lend a good hand to those who are planning to climb the peak and ensuring to conquer it. Below, I listed 4 major problems that led to this failed attempt. To reach our planned jump-off point, which is Brgy Tagbao, we need to hire habal-habal from JY square. It took us an awful lot of time negotiating with the drivers. 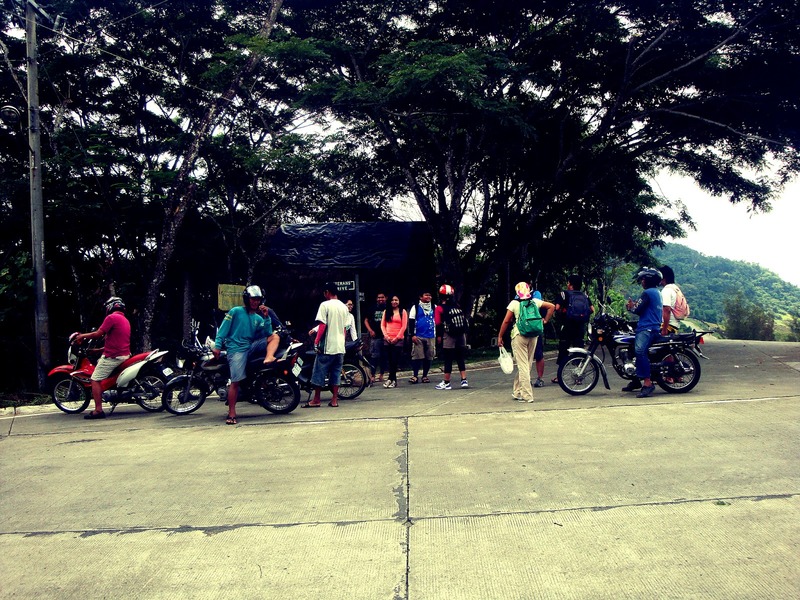 Initially, they were asking for 500 Pesos for each motorcycle. There were 10 of us. From what we have heard, the normal rate is at 120 Pesos for each person which makes 240 for each motorcycle. There was such huge difference. When we climb, budget is always a priority. Our low ballers' mind got activated and made us as hard as stone to give in to their offer. After several attempts to keep the fare as low as possible, we met to an agreement, 125 Pesos each person. It sounded fair and then off we went. Resting in climbing is a must. But too much resting is not advisable. For one psychological reason, your body might get used to resting too much making you lazy to get up and move up ahead. Or worse, letting you fall asleep! We had several long stops on our way up. One stop was even an hour of rest. This was when we even did not reach the foot of the mountain yet. 1-hour rest here. 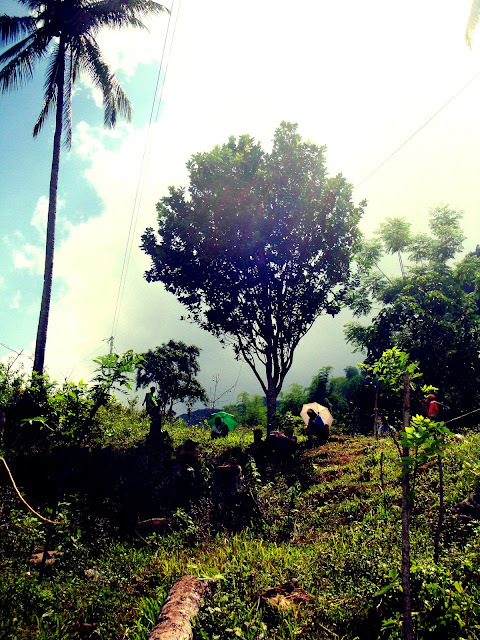 We drank buko juice, told stories, enjoyed the moment as if we're in the summit. 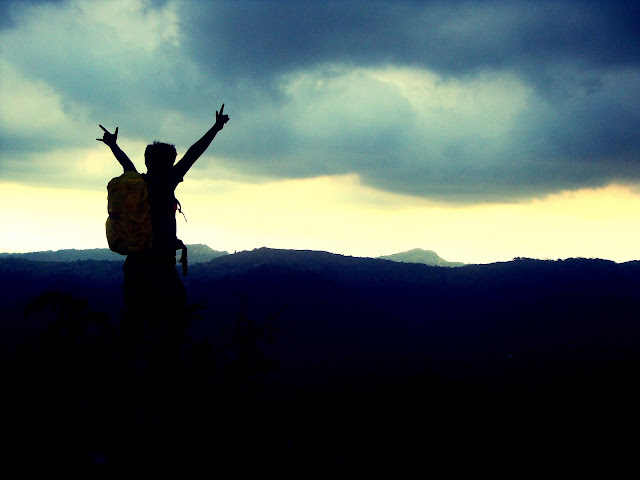 When you go climbing, it is a necessity to keep your body in shape at least 1 month before the scheduled trek. The group usually plays basketball and jogs in the afternoons before we go climbing. That is our routine until we stopped about 2 months before this climb. For some aggressive reason, we still pushed this climb without even thinking of physical capabilities. This led to decreased stamina and early stress causing us to find more rest. We originally aimed for a day trek. Considering we planned on climbing two mountains, it was best if we anticipated for a possible two-day trek. We were not able to bring tents and other sources to keep us alive for 2 days in the mountains. Hence, when it was already night time and we were not yet stepping on the foot of the mountain, there came the majority decision to retreat and go home. Now, just because we were not able to reach the summit does not mean we did not enjoy our trek. The spirit of camaraderie was even more distinct this time. We enjoyed the moment, captured beautiful scenery, and most importantly, connected with nature. 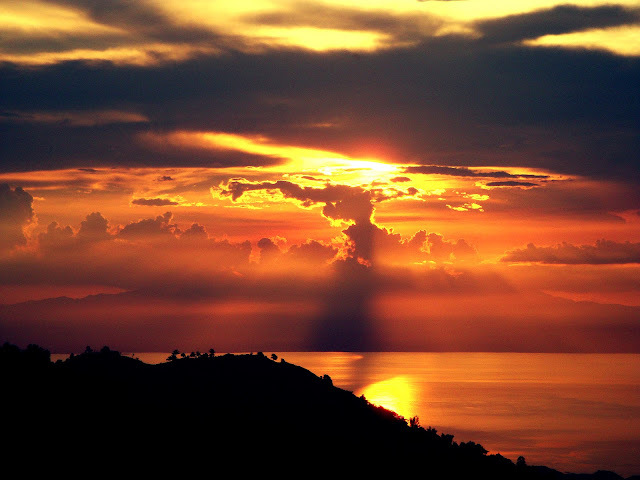 Sunset in the Balamban mountains. More photos HERE. This will not stop here. We are still planning for an "I shall return" moment to these mountains. no. 5: There is this couple who was delayed from the 7am Scheduled time. :D sorry guys! nice set of pictures Leandro! especially and first and last... cheers to more katkat sa bukid and travels! Wife and I went to Midway Minkay beach resort as part of my birthday celebration. We agreed to go out more often while we don't have kids yet. The resort is located in the Municipality of Initao, around a 45-minute bus ride from Iligan city where we live. We took a Rural bus transit with a fare of P85 each person. The resort staff were friendly and polite. Area was clean and we enjoyed the white sands. We rented a room for two for P1,799 a night with complimentary breakfast. The food was great and there were a lot of amenities that you can enjoy such as renting banana boat, zip line and jet skis. Overall, we had an awesome time. I highly recommend the place. Here is a video I created about the resort. Contact numbers and rates are found in the video. Long weekend came again so it was a great time for the family to enjoy the wonderful beach called Masterson Reef Beach Resort. It is located in Initao, Misamis Oriental. We had a good and enjoyable time. Check out the video of the place below. This blog's domain (onlinepinoy.net) has been running for 2 years now. It had the regular http URL with no SSL certificate. Just recently I discovered that there is a free SSL certificate offered by Google/Blogger. This is a good update since having https in your URL increases website credibility and organic rankings. Go to Settings then Basic then select Yes to the https options just like below. Now, my URL is appearing as secure: https://www.onlinepinoy.net/. Your website rankings might be affected for now but don't worry everything will go back or even better, increase. Tip: Don't forget to update Google Search Console and Analytics using the new URL with https.